Have you been swimming most of your life? Do you feel like a fish in the water? Or do you have more of a cat-like aversion to the water? Regardless of your answer to these questions, there’s probably something you could do better. 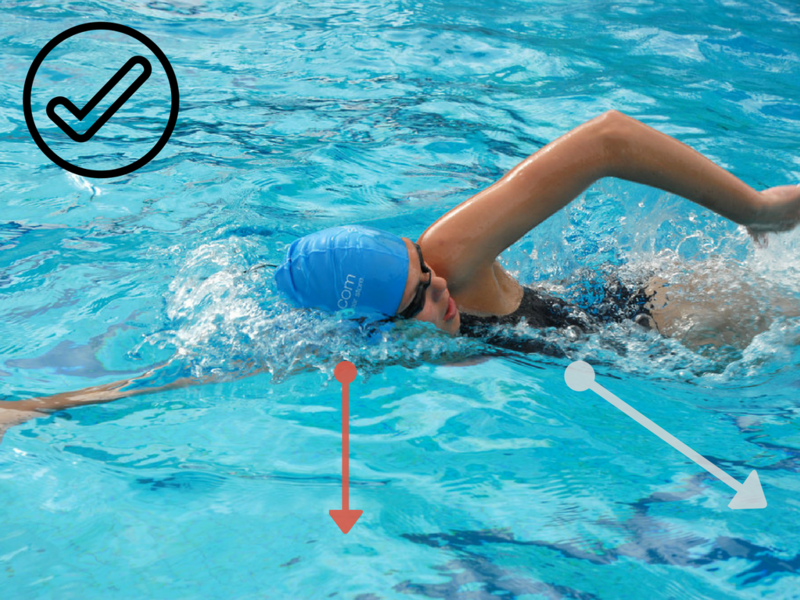 If you’ve read our Ultimate Beginner’s Guide to Swimming, then you probably know the basic strokes and how to kick well enough to float and propel yourself through the water. But after that, there is a seemingly endless list of technique tweaks you could work on. And all of them claim equal importance. Entry form, flip turns, finger position, kick rhythm, stroke entry, stroke exit, dolphin kick, reducing drag, arm angles, core strength…. Frankly, it can be overwhelming. We’ve gathered the 5 most common swimming mistakes and how to fix them. You can master one at a time or take them all on at once, whatever works best for you. And once you’ve got these down, you should be swimming faster and easier! The most common mistake all around is improper head position. The natural tendency is to look forward while swimming to see where you’re heading. While this instinct is understandable, it’s a habit needs to be broken. When you raise your head to be able to see, it causes your hips to automatically drop. 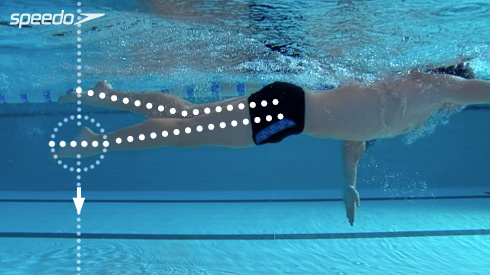 This means you swim lower in the water, increasing resistance and slowing you down. 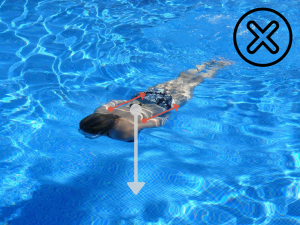 This photo from Endurance Swimming shows that your head should face down and hit the waterline while swimming (Image Source). The easiest way to fix this problem is to find something on the bottom of the pool to watch. Most pools have a line painted at the bottom of each lane for this purpose. It might take you a little while to feel comfortable with this, but keep trying! This mistake comes when you breathe during the wrong time of your stroke. It’s important to get your breathing rhythm down correctly, so you’re not worrying about passing out or breathing in a lungful of water. Breathing too early during your stroke is one common mistake. It’s easy to start your breath as your arm begins to exit the water. This causes your arm to be in front of your face and increases the chance of swallowing water. It is best to begin the breath as your hand enters the water to begin the pull part of the stroke. Then, finish the breath as your hand exits the water. Don’t forget to rotate which side you breathe on, too! 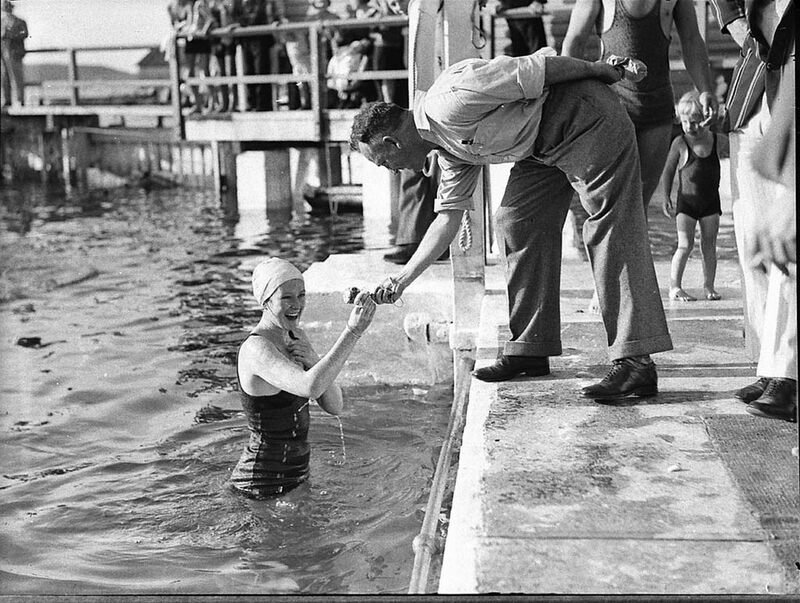 The swimmer’s hand is nearly entering the water again as she takes a breath. To fix this, pay attention to when you are breathing during your laps. Do a few laps concentrating solely on breath timing. Also, make sure you are exhaling out through your nose. It helps promote higher quality, more efficient inhalation. And it helps you relax instead of holding your breath when your face is in the water. Your first instinct would have you think that the more you kick, the faster you’ll propel yourself. 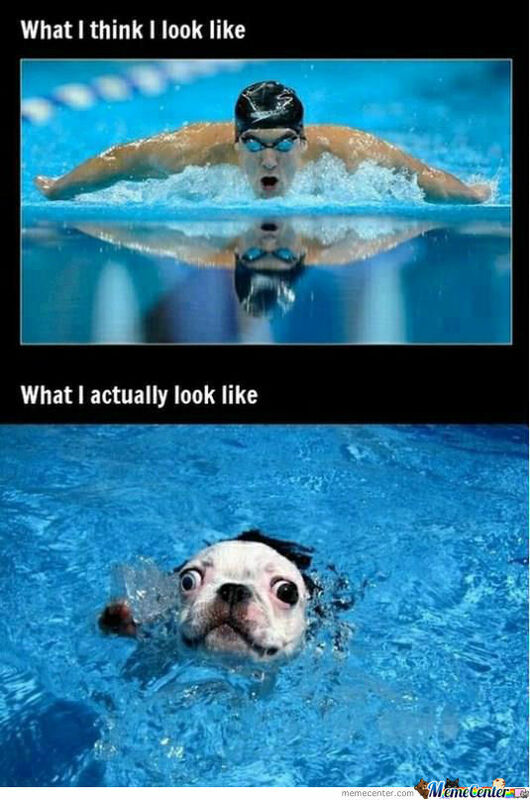 As far as the front crawl, the most popular swim stroke, is concerned, this is actually untrue. 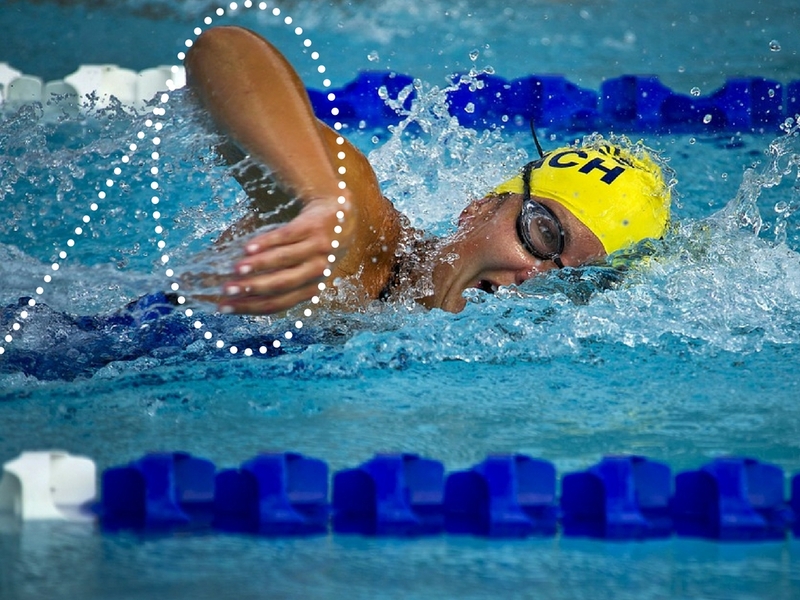 Increased velocity in the arm strokes have been specifically shown to correlate with increased swim velocity in the front crawl. Kicking in the front crawl stroke does provide a little thrust, but its main role is to regulate the vertical position of the body while it is suspended in water. Expending all of your energy in the kick could be why your swim speed is slower than it could be. You don’t want to over-do the kick, but you still want to get the most out of it. The most common kicking mistake is to bend your knees while kicking. If you do this, you increase the surface area creating resistance. Instead, you want to keep your legs as straight as possible. The easiest way to correct this mistake is to visualize kicking from your hips, not your legs. As you do this, try to also keep your ankles as loose as possible. If needed, you can stretch your ankles before to increase flexibility. And be sure to keep your kicks strong but controlled. Over-kicking will just cause you to burn out faster with little to no benefit to your speed. Many people have a tendency to swim with their belly button always facing the bottom of the pool. This is called swimming flat. This mistake seems almost contradictory at first. Of course, you want your body to remain as straight and streamlined as possible when you swim. The problem with swimming flat comes, not from your body alignment, but from how you move through the water. In reality, you should be rolling to the side with every arm stroke, allowing your arm a more natural stroke pattern. At the end of each stroke, your navel should face the side of the pool, and rotate to face the other side of the pool with each dig. To fully and successfully accomplish this, make sure you are fully extending your arm on each stroke, because the only way for that to happen will be by rolling to the side a little. If you pay attention while swimming, you should feel the rotation. And you will know you’ve done it correctly if your armpit is facing down. Also, keeping a tight core will make the rolling easier. Remember how the arm pull is more effective at propulsion than the kick? This means you need to make sure you’re keeping your strokes as efficient as possible. The most common way to compromise your stroke is by shortening it. 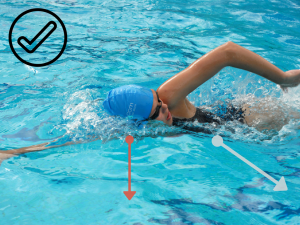 Keep a full extension while entering and exiting the stroke. Don’t exit too early. When you shorten your stroke, you’re not getting the most forward motion for your effort. In order to compensate for this, you will then have to stroke more often, and you will tire quicker. One of the best ways to improve is to count each stroke during laps. If you notice your stroke count going up, then you’ll know you need to keep practicing fuller strokes. You could also have someone else watch to see if you start to shorten your strokes during practice. Now that you know what to look for, it’s time to go put it into practice! And remember you don’t have to work on everything at once- just take it one skill at a time and soon you’ll be flying down the lanes. Are there any particular techniques you have a hard time mastering? Have you noticed any common mistakes I didn’t mention? Let us know in the comments!